There are many benefits to getting tested, regardless of the eventual result. If one of your family members — however distant — had cancer, there is a chance that you inherited a gene mutation that not only increases your personal risk of cancer, but also could be passed to the next generation. Those who are carriers of hereditary cancer gene mutations, could be at risk of getting cancer earlier in life than the general population. The sooner genetic testing is done, the more likely it is that the risk can be managed appropriately. 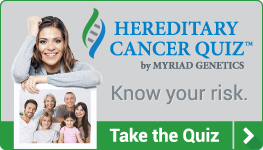 Myriad’s Hereditary Cancer Quiz helps you to assess whether you might be a candidate for hereditary cancer genetic testing. Click here to take the easy, 30-second Hereditary Cancer Quiz.